Rocky Mountain Fur Company (1822-1833) – Sometimes referred to as Ashley’s Hundred, the Rocky Mountain Fur Company was organized in St. Louis, Missouri in 1822 by General William Henry Ashley and Major Andrew Henry. They posted advertisements in St. Louis newspapers seeking “One Hundred enterprising young men . 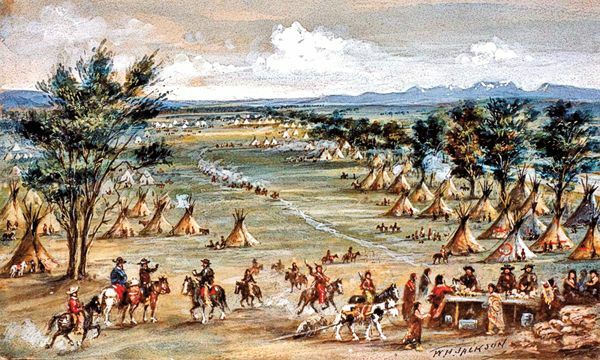 . . to ascend the Missouri River to its source, there to be employed for one, two, or three years.” Among those hired were Jedediah Smith, William Sublette, Jim Beckwourth, Thomas Fitzpatrick and David Edward Jackson, just to name a few. Rather than relying on trading furs and pelts with the Indians, the Rocky Mountain Fur Company trained their men to do the trapping. Unlike their rivals, Hudson’s Bay Company and the American Fur Company, the Rocky Mountain Fur Company built no forts or trading posts, as their men worked independently. However, the company held “rendezvous” every summer, gathering their men in various locations, where they could gather the pelts. It was also a chance for the mountain men to relax and enjoy themselves after long periods of working alone. They often held their rendezvous near a Hudson’s Bay Company post to draw off some of their Indian trade. In 1826 Jedediah Smith, William Sublette and David Jackson bought the Rocky Mountain Fur Company. They hired more mountain men, some of which who would become the subject of many a dime novel, such as Jim Bridger, Joe Meek, Kit Carson and Robert Newell. The company prospered for the next seven years until the fur trade declined in the 1830s due to major decline in the beaver population and the fact that beaver hats were going out of style, replaced by hats made of silk.